InService is a modern company that ensures emergency service, repairs and maintenance of public utilities of buildings on the entire territory of the Czech and Slovak Republic and also locally, in Budapest. We have European ambitions; at the present time we are in the process of preparing coverage of neighboring states by our services. Currently, our clients consist of, in particular, owners of retail shops, cafés, restaurants and hotels as well as of housing associations, state administration buildings and individual apartments or one-family houses. InService is a separate company that belongs to the financial group of the Integra group – the biggest supplier of commercial interiors in the Czech Republic. Experiences in the area of a major company management and sound financial background allow us to build up our company at a rapid rate and in high quality. 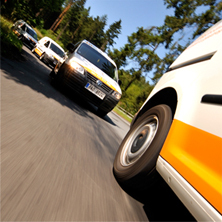 We create a company that offers the highest-level-services; there is no other company like this in the Czech Republic. We are a self-confident and strong company that offers real partnership to our clients, as well as security and above-standard care. You will soon learn how we back up everything what we say about ourselves.